A new visceral memoir of a year of combat with Alpha Company, 1st Infantry Battalion, in Vietnam, 1966. • An engaging narrative of how Clark went from being an ordinary American civilian to a battle-hardened veteran. Clark gradually learns the techniques developed by US troops to cope with the daily horrors they encountered, the technical skills needed to fight and survive, and how to deal with the awful reality of civilian casualties. Fighting aside, it rained almost every day and insect bites constantly plagued the soldiers as they moved through dense jungle, muddy rice paddy and sandy roads. From the food they ate (largely canned meatballs, beans and potatoes) to the inventive ways they managed to shower, every aspect of the platoon's lives is explored in this revealing book. The troops even managed to fit in some R&Rwhilst off-duty in the bars of Tokyo. 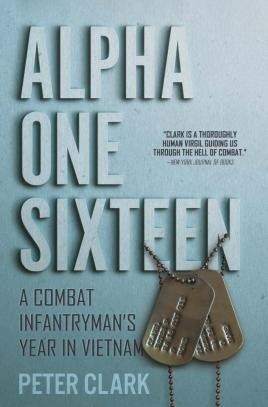 Alpha One Sixteen follows Clark as he discovers how to cope with the vagaries of the enemy and the daily confusion the troops faced in distinguishing combatants from civilians. The Viet Cong were a largely unseen enemy who fought a guerrilla war, setting traps and landmines everywhere. Clark's vigilance develops as he gets used to ‘living in mortal terror,' which a brush with death in a particularly terrifying fire fight does nothing to dispel. As he continues his journey, he chronicles those less fortunate; the heavy toll being taken all round him is powerfully described at the end of each chapter. A grunt's account, gritty and napalm-raw, that exudes a stylish cynicism—one of the best memoirs to emerge from the Vietnam War. In intelligent, articulate and beautifully evocative language he renders an honest, moving and richly nuanced account of what it was like to go to war and then, being wounded, to come home again. Compassion, good sense, and decency permeate every page. An outstanding contribution to the literature of the Vietnam War. Thoughtful, provocative memoir of slogging through one of the worst of many bad years of the Vietnam War...A worthy entry in the vast library of books devoted to a misbegotten conflict. This is one of those books - from a personal perspective anyway - that I had to keep reading. Not just for the account of the fighting but for the gentle humour and humanity that the author displayed…. A damn good book and I would heartily endorse it.